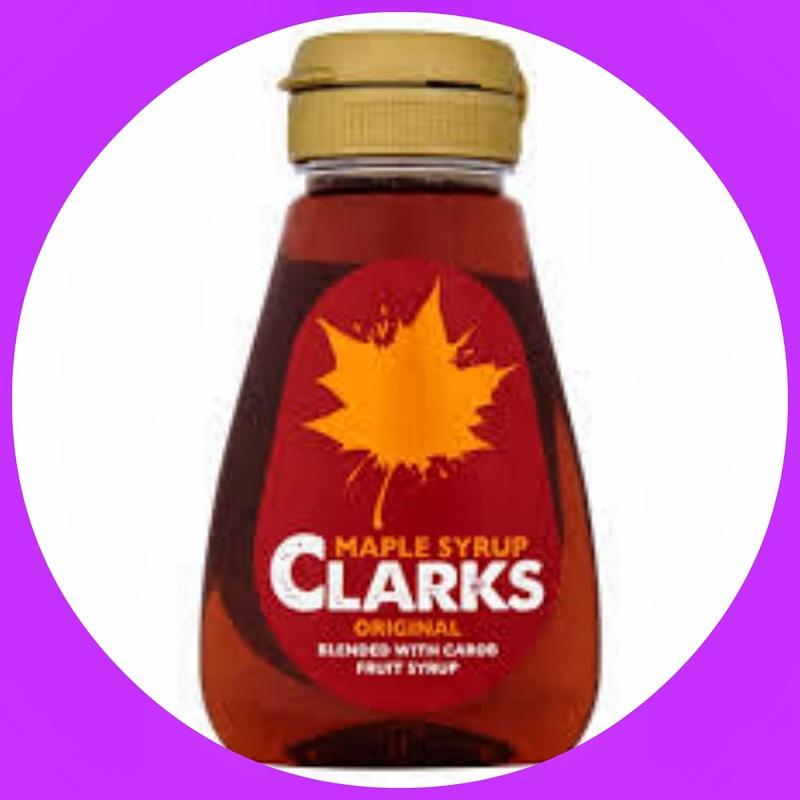 I absolutely love pancake day, so when I was asked if I would like to try out some pancake recipes from Clarks Maple syrup I was delighted of course to agree. I am going to give you the recipe they sent to me for inspiration and then show you the pancakes and recipe I used. Heat the milk in the pan until its scalding and remove from the heat. whisk the egg yolks with sugar in a heat proof bowl until thick and creamy, slowly whisk in the warm milk. Set the pan over a bowl of simmering water and stir with a wooden spoon until the mixture slightly thickens to coat the back of the spoon, Remove from the heat and stir in the maple syrup. Leave to cook completely then chill for one hour. Whip the cream until soft peaks form, Fold the cream into the cold honey and custard. Remove from the freezer 15 minutes before needed and leave at room temperature to soften slightly. Add the eggs and milk whisk well to make a smooth batter. In a separate, clean, metallic bowl, whisk the egg whites until soft peaks form, then fold into the batter using a spatula. Heat a heavy, non stick frying over a low-medium heat. Add the butter and heat until gently foaming using a small ladle, ladle the mixture into the frying pan in even measures to form small pancakes, fry for 2-3 minutes, then flip using a spatula ( The underside should be golden) remove from the pan and keep warm insulated in foil, and repeat with the remaining batter. Place the strawberries, blueberries and bananas into a bowl, Mix the caster sugar together with the cinnamon and then scatter over the mixed fruits. Combine well with a spoon and set aside for 20-30 minutes until needed. 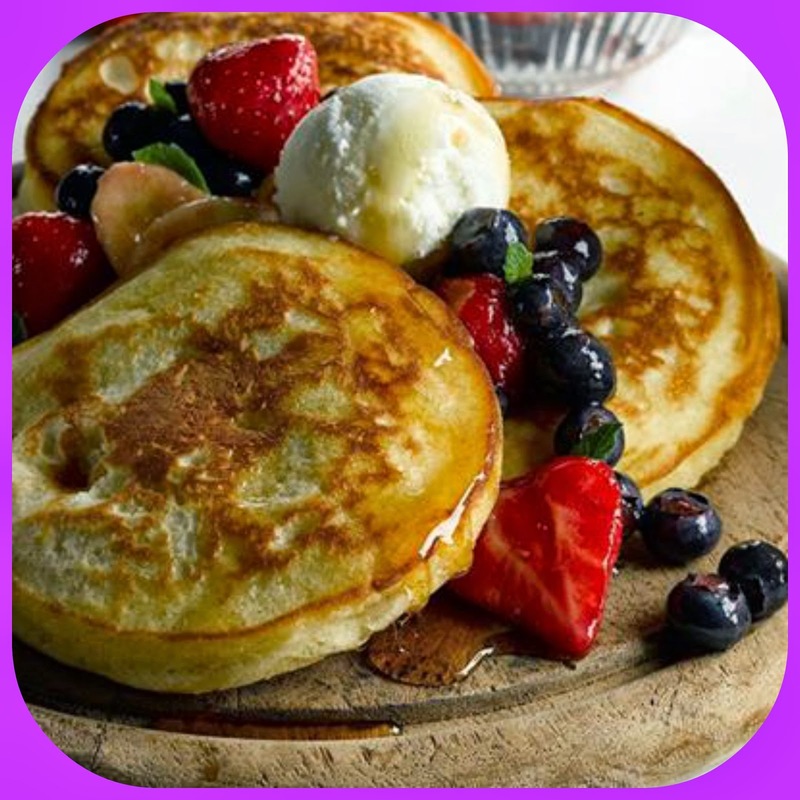 When ready to serve, stack the pancakes onto the centre of each plate, scatter the cinnamon fruits and finish with a scoop of maple syrup Ice Cream and lashings of maple syrup. They look delicious don't they! well I didn't quite follow this recipe for the pancakes because Im not to fond of to much bread and unfortunately I don't own an icecream mecheine. This is how I made mine. Next gradually add small quantities of the milk and water mixture, continuing to whisk throughout. When all the liquid has been added, then whisk once more until the batter is smooth, then melt the 50g/2oz of butter in a pan. Spoon 2 tbsp of it into the batter and whisk it in, then pour the rest into a bowl and use it to lubricate the pan, using a wodge of kitchen paper to smear it round before you make each pancake. Now get the pan really hot, then turn the heat down to medium, spoon the batter into a ladle so it can be poured into the hot pan in one go. As soon as the batter hits the hot pan, tip it around from side to side to get the base evenly coated with batter. It should take only half a minute or so to cook of course depending on how thick you would like your pancakes you can lift the edge with a palette knife to see if it's tinged gold as it should be. Flip the pancake over to the other side, this will need probably only need a few seconds again of course depending in the thickness of the pancake - then simply slide it out of the pan onto a plate. Stack the pancakes as you make them, they do stay warm maybe use something to cover them so they stay warmer just that bit longer. Once ready top them or fill them with you favourite fillings, I of course used maple syrup and strawberries they were simply delicious, I also had one with caster sugar and orange, Its the fist time I have ever tried Clarks maple Syrup I found it really delicious its not to thick in texture and not to sweet I will definitely be enjoying Clarks Maple Syrup with pancakes again. I was sent Clarks Maple syrup and some recipe ideas for the purpose of this post all opinions remain honest and my own.